We interrupt your regularly scheduled vignette to bring breaking transmogrification news! I have created my very first transmog set for my primary character, Amaranthine. It is missing matching shoulders and belt, and it isn't the set I really wanted, but it is a step in the right direction. She's wearing: Gypsy Tunic, Gypsy Trousers, Vindicator's Leather Moccasins, Ravager Hide Gloves, and Ogre Mage Staff. Any suggestions on how to fill in the missing belt and shoulders would be greatly appreciated, as I am just running with them un-transmogged at this point. I've been scanning through gear lists, and so far have my eyes on the Spaulders of Reclamation for the shoulders, but that means running through Sunwell Plateau, and well, I'm just not sure I'm that lucky. Not to mention they are rather a bit showy for this simple outfit. My few readers, please tell me, what do you think? 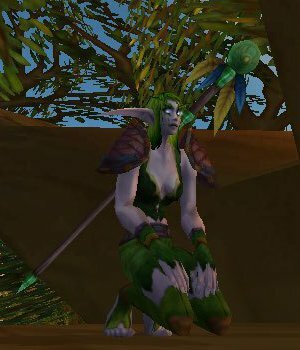 I think she looks quite lovely and druidy! I'm just happy I finally found a way to overcome Blogger and post here again and tell you! Oh goodness! Didn't realize how much of a pain Blogger is for commenting. Glad you found a way to make it work. And thanks. I'm kind of going for a young druid-in-training look. What about either the Cenarion Spaulders or the yellow recolour from the Botanica? The yellow version would complement the yellow in the staff and leaves always look good on Druids. Thanks, Cymre! That means a lot coming from you.